Since 1 July 2006, all dogs registered in New Zealand for the first time (except farm dogs used for stock control) must be microchipped. This applies mainly to puppies when they are first registered at three months. Dogs classified as dangerous or menacing, dogs impounded but not registered and dogs registered but impounded twice are also required to be microchipped. 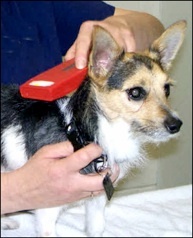 Microchipping is a more permanent method of identifying a dog than collars and tags which can be lost or removed. A microchip is permanent and, providing it meets the required standards and has been inserted correctly, it will function safely for the life of your dog. Microchipping was introduced for two main reasons. It enables a dog to be linked to its owner, so if it is lost or stolen, both dog and owner can be identified and reunited. A microchip can also clearly identify a dog which has been aggressive and classified as dangerous or menacing. This is especially important as it renders owners unable to disguise their dog’s identity. Any dog found straying by an animal control officer, or taken to a welfare agency such as the SPCA, or injured and taken to a vet is routinely scanned and, if microchipped, can speedily be restored to its owner. Unless the information is recorded on the council data base, the owner is not complying with the law and a dog picked up straying may be rehomed or euthanized rather than returned to its owner. The only way to ensure that your pet can be returned to you if it is lost or stolen is to have it microchipped and recorded on the council’s data base. Data will be automatically be added to the National Dog Database. It is the owner’s responsibility to take the microchipping certificate to the council to have the information recorded as part of the registration process and checked to confirm that it meets the regulations. You must also notify the council if information has changed – for example, if the dog has died or has been transferred to a new owner. In New Zealand, The Dog Control Act 1996 requires all dogs over 3 months old to be registered with their local council every year by 1 July. If your dog reaches the age of 3 months after 1 July it must be registered by the date it reaches that age. Registration fees are set by councils to take into account the cost of providing dog control services in their area and also to ensure that dog owners bear the costs of dog control and the subsequent benefits to ratepayers of having safe and well controlled dogs in their community . Each council keeps a record of all dogs registered. Information on the dog and its owner along with its microchip number (if it has one) is provided to the National Dog Data Base (NDD). The NDD enables lost and stolen animals to be reunited with owners and keeps track of dogs deemed to be menacing and dangerous. Dog registration and microchipping are two separate processes. You must register your dog every year, but you only need to microchip your dog once. Important: Failure to register your dog is an offence against the Dog Control Act 1996 and will result in a $300 fine.